Explore the wilderness of the Selous Game Reserve before relaxing at the idyllic beaches of Zanzibar with this comprehensive eight-night itinerary. 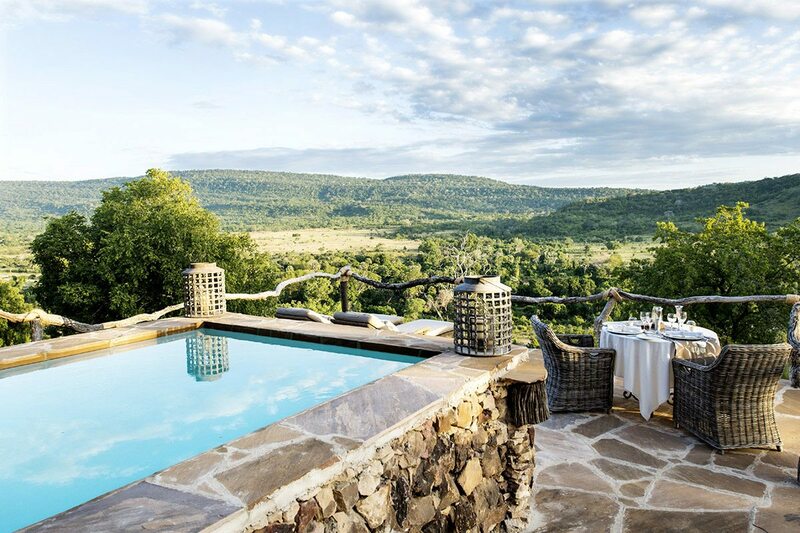 You’ll stay in an open-fronted banda and a private villa at two luxury Tanzania safari lodges, each with exclusive safari activities, from walking and boat safaris to watersports, diving and snorkelling. 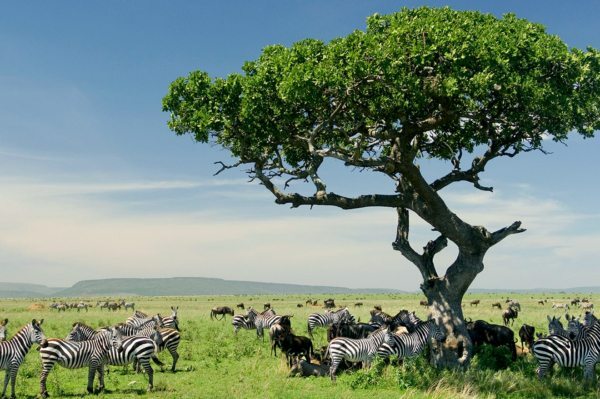 An itinerary that combines the untouched wilderness of southern Tanzania’s Selous Game Reserve with the sandy shores and warm waters of Zanzibar. Opportunities to roam the remote Selous on game drives, explore the Rufiji River Delta by boat, sleep in a Selous treehouse, scuba the vibrant coral reefs of Zanzibar, swim with dolphin in Zanzibar and watch the sunset from a dhow in Zanzibar. 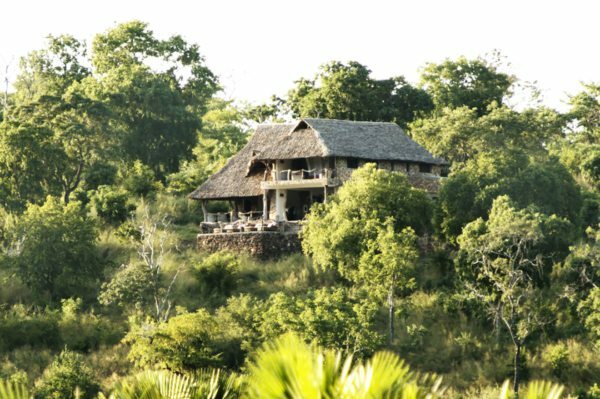 Stays in an open-fronted banda, a luxury treehouse and a private seaside villa with its own plunge pool. 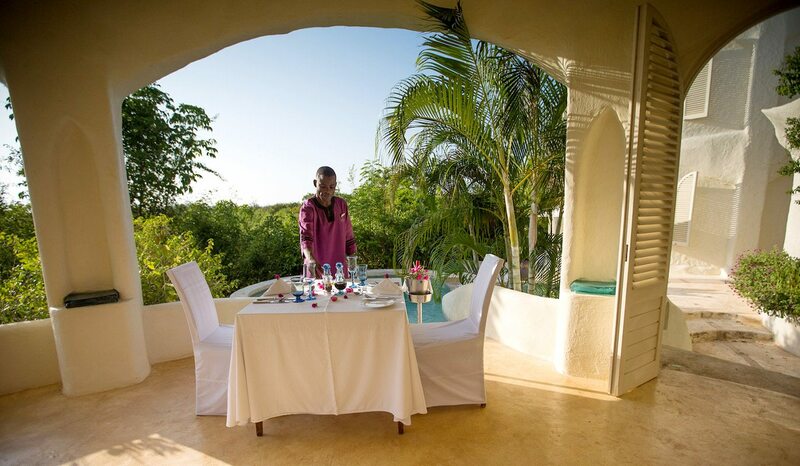 For more information see Beho Beho and Kilindi Zanzibar. We could hardly contain our excitement on the drive to Beho Beho from the airstrip, taking endless pictures of our state-of-the-art Land Cruiser, our friendly guide and several iconic baobab trees before we even reached the eight beautiful guest bandas on our luxury Tanzania safari.Made of stone and thatch, our banda was completely open to the bush from the front, and although this ensured we felt like were already out in the wild, we couldn’t wait to explore the Selous Game Reserve on a game drive. Later, we joined the other guests for a communal dinner, eager to share our sightings – such as the intricate nests of social weavers, an elephant browsing on a sausage tree and the enormous crocodile of the Rufiji River.Up early the next day, we went on an excursion to Lake Tagalala and Maji Moto. The 45-minute game drive to get there passed in a flash, and we spotted some curious giraffe and a lone buffalo in the thickets. We enjoyed a hearty packed breakfast on the lake shore, and then floated about under our canopied boat during the balmy heat of day, seeing hippo, crocodile and waterbirds frolicking in the water. As the temperature cooled, we enjoyed a swim in the healing waters of the hot springs before heading back to camp for sundowners at the campfire.Our third day combined a walking safari with an overnight at the Beho Beho treehouse. On the way, our guide for the day took us past the grave of Frederick Courteney Selous, after whom the reserve is named – a hunter turned conservationist who lost his life here during World War I. After a delicious campfire dinner we slept under the stars in a giant leadwood tree, our double bed draped in mosquito netting. Our trusty guide guarded us through the night.Waking up to the sunrise from our perch overlooking the sandy riverbed was an unforgettable experience. Though we could have continued on another walking safari, we chose to be driven back to camp to relax and enjoy the facilities. We lazed at the pool for a while, then spent the afternoon viewing the wildlife that came to visit the waterhole from a telescope on our verandah. That evening, we joined a last lively game of billiards in the bar before reluctantly turning in. 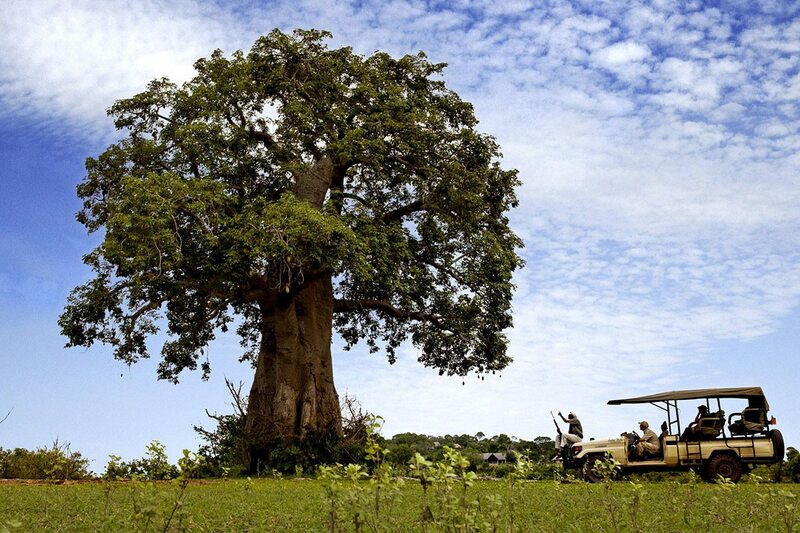 We could hardly contain our excitement on the drive to Beho Beho from the airstrip, taking endless pictures of our state-of-the-art Land Cruiser, our friendly guide and several iconic baobab trees before we even reached the eight beautiful guest bandas on our luxury Tanzania safari. Made of stone and thatch, our banda was completely open to the bush from the front, and although this ensured we felt like were already out in the wild, we couldn’t wait to explore the Selous Game Reserve on a game drive. Later, we joined the other guests for a communal dinner, eager to share our sightings – such as the intricate nests of social weavers, an elephant browsing on a sausage tree and the enormous crocodile of the Rufiji River. Up early the next day, we went on an excursion to Lake Tagalala and Maji Moto. The 45-minute game drive to get there passed in a flash, and we spotted some curious giraffe and a lone buffalo in the thickets. We enjoyed a hearty packed breakfast on the lake shore, and then floated about under our canopied boat during the balmy heat of day, seeing hippo, crocodile and waterbirds frolicking in the water. As the temperature cooled, we enjoyed a swim in the healing waters of the hot springs before heading back to camp for sundowners at the campfire. 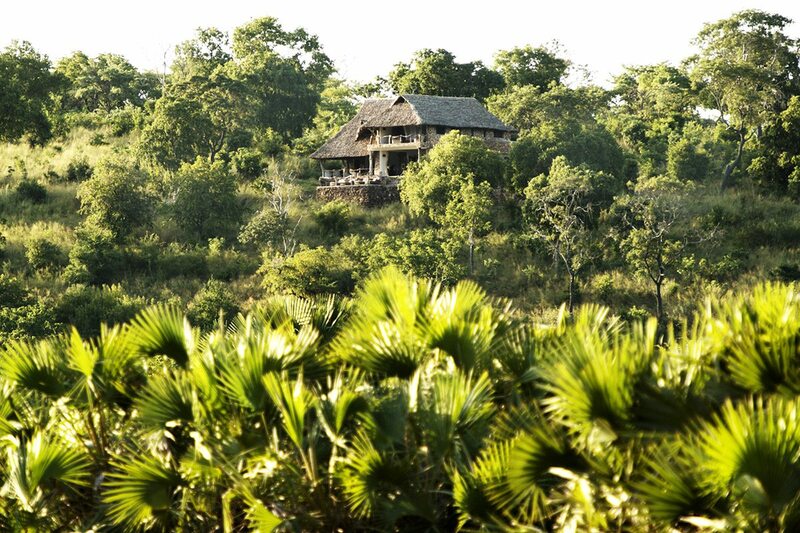 Our third day combined a walking safari with an overnight at the Beho Beho treehouse. On the way, our guide for the day took us past the grave of Frederick Courteney Selous, after whom the reserve is named – a hunter turned conservationist who lost his life here during World War I. After a delicious campfire dinner we slept under the stars in a giant leadwood tree, our double bed draped in mosquito netting. Our trusty guide guarded us through the night. Waking up to the sunrise from our perch overlooking the sandy riverbed was an unforgettable experience. Though we could have continued on another walking safari, we chose to be driven back to camp to relax and enjoy the facilities. We lazed at the pool for a while, then spent the afternoon viewing the wildlife that came to visit the waterhole from a telescope on our verandah. That evening, we joined a last lively game of billiards in the bar before reluctantly turning in. An exciting light aircraft flight got us safely to Zanzibar, and the next thing we knew we were at our home for the next few days of our luxury Tanzania safari, a private villa at Kilindi Zanzibar.After wandering through the lodge’s tropical gardens, we decided to pass the day in a blissful state of sun, sand and sea. We thoroughly explored the sea life of Zanzibar while scuba diving, discovering plentiful fish, vivid corals and, on one special occasion, even sighting a distant whale passing by. After such a busy day outdoors, the best possible way to relax was a spa treatment … followed by a swim in our private plunge pool. Dinner was a sumptuous affair, with greens fresh from the organic garden served with just-caught seafood from the sea.Waking up early the next day, we embarked on a guided walking tour through the fascinating labyrinth of streets and alleyways that make up Stone Town, the old city and cultural heart of Zanzibar. Our guide took us to the former slave market, various cathedrals and mosques, and pointed out countless ornate carved doors. We also heavily supported Stone Town’s bustling craft markets and numerous gift shops! We ended off our magical day with a sunset dhow cruise along the coast of Zanzibar, seeing the island from a different perspective as we enjoyed sipping at cocktails to the brilliant backdrop of the setting sun.The next morning we enjoyed our daily tray of coffee and biscuits on our verandah, while discussing our day’s activity. We opted for snorkelling along the coral reefs, hoping to see some of the abundant fish that thrive in the island’s tropical waters. A boat trip took us to some of the more exclusive spots; we were even accompanied by a school of dolphin at one point! We ended off our day of adventure with a pamper session at the spa, before my partner surprised me with a private dinner on the pristine white sands of the beach.The final day of our luxury Tanzania safari was something entirely different – a trip to Zanzibar’s lush Jozani Forest, one of the last remaining sanctuaries in the world for the red colobus monkey. Our guide took us along a nature trail flanked by eucalyptus and mahogany trees, explaining the medicinal properties of various plants and telling us about the animals, birds and reptiles that live in this rainforest and its mangrove swamps. Returning back to the lodge, we enjoyed drinks at the waterfall bar overlooking the infinity pool and the Indian Ocean, before going back to our room and packing up for our flight back home the following day. An exciting light aircraft flight got us safely to Zanzibar, and the next thing we knew we were at our home for the next few days of our luxury Tanzania safari, a private villa at Kilindi Zanzibar. After wandering through the lodge’s tropical gardens, we decided to pass the day in a blissful state of sun, sand and sea. We thoroughly explored the sea life of Zanzibar while scuba diving, discovering plentiful fish, vivid corals and, on one special occasion, even sighting a distant whale passing by. After such a busy day outdoors, the best possible way to relax was a spa treatment … followed by a swim in our private plunge pool. Dinner was a sumptuous affair, with greens fresh from the organic garden served with just-caught seafood from the sea. Waking up early the next day, we embarked on a guided walking tour through the fascinating labyrinth of streets and alleyways that make up Stone Town, the old city and cultural heart of Zanzibar. Our guide took us to the former slave market, various cathedrals and mosques, and pointed out countless ornate carved doors. We also heavily supported Stone Town’s bustling craft markets and numerous gift shops! We ended off our magical day with a sunset dhow cruise along the coast of Zanzibar, seeing the island from a different perspective as we enjoyed sipping at cocktails to the brilliant backdrop of the setting sun. The next morning we enjoyed our daily tray of coffee and biscuits on our verandah, while discussing our day’s activity. We opted for snorkelling along the coral reefs, hoping to see some of the abundant fish that thrive in the island’s tropical waters. A boat trip took us to some of the more exclusive spots; we were even accompanied by a school of dolphin at one point! We ended off our day of adventure with a pamper session at the spa, before my partner surprised me with a private dinner on the pristine white sands of the beach. The final day of our luxury Tanzania safari was something entirely different – a trip to Zanzibar’s lush Jozani Forest, one of the last remaining sanctuaries in the world for the red colobus monkey. Our guide took us along a nature trail flanked by eucalyptus and mahogany trees, explaining the medicinal properties of various plants and telling us about the animals, birds and reptiles that live in this rainforest and its mangrove swamps. Returning back to the lodge, we enjoyed drinks at the waterfall bar overlooking the infinity pool and the Indian Ocean, before going back to our room and packing up for our flight back home the following day. 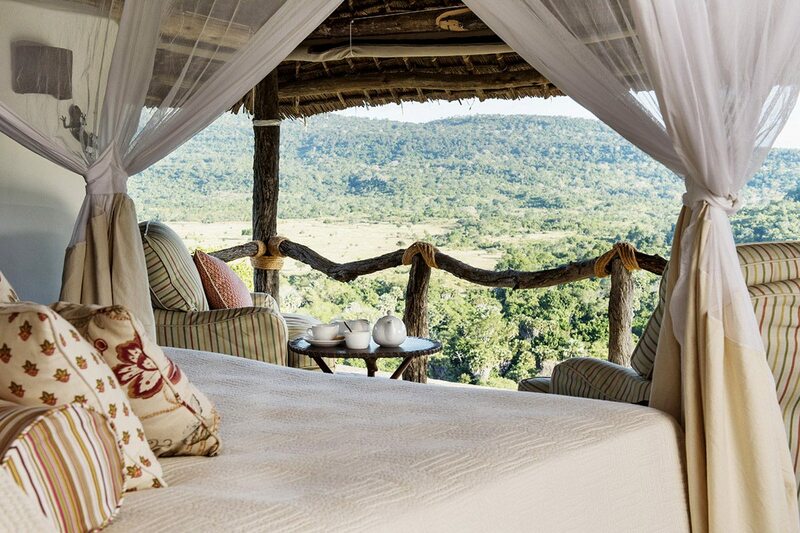 Our luxury Tanzania safari surpassed all our expectations. We experienced the unadulterated wilderness of the Selous Game Reserve in southern Tanzania – discovering the resident animals with a host of different guides, each with their own stories and distinctive guiding style. Seeing a black rhino here, in one of its last strongholds, was an unexpected privilege. We also particularly enjoyed the activities at Beho Beho – from the boating safari along the crocodile-infested Lake Tagalala to the incomparable experience of a walking safari that ended with us sleeping in a romantic treehouse.The white sands and turquoise waters of Zanzibar following this were like another world, though not one without its own brand of safari magic! A particular highlight was tracking the colobus monkey and discovering the mangrove swamps of Jozani Forest. We snorkelled, dived and swam in Zanzibar’s turquoise waters, encountering numerous fish and dolphin and learning about some of the challenges of preserving this unique marine life. Both lodges provided impeccable service with hospitality that made us feel right at home, one a family-like environment with communal dining, the other, a private villa with its own butler and meals anywhere we liked. From tea trays each morning to incredible guiding, mouthwatering food and stunning views, each place was unforgettably special – and we can’t wait to return. 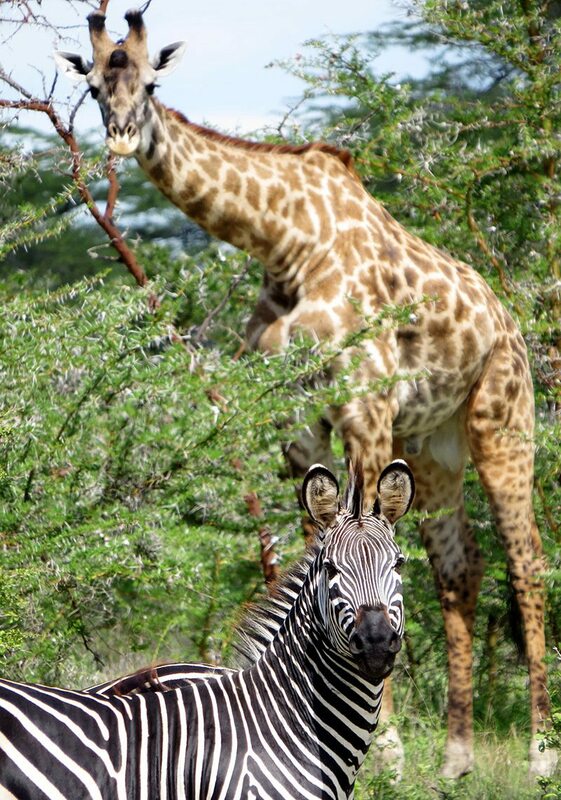 Our luxury Tanzania safari surpassed all our expectations. 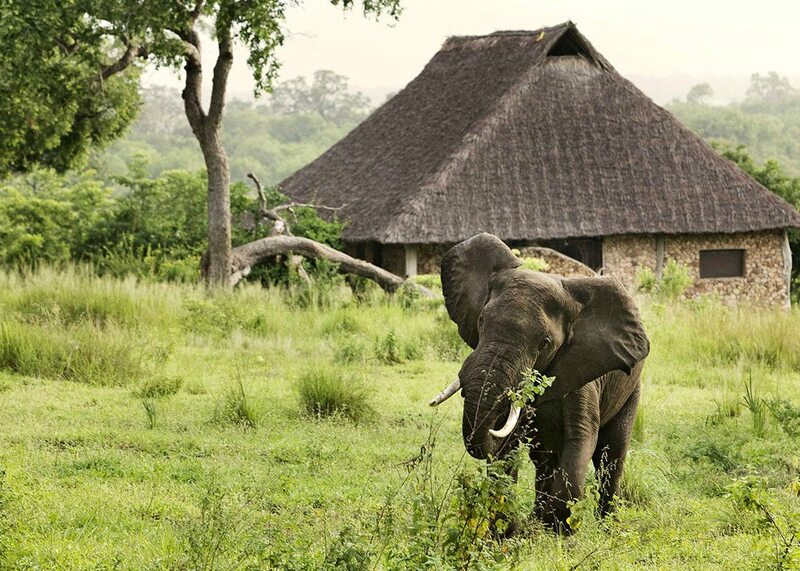 We experienced the unadulterated wilderness of the Selous Game Reserve in southern Tanzania – discovering the resident animals with a host of different guides, each with their own stories and distinctive guiding style. Seeing a black rhino here, in one of its last strongholds, was an unexpected privilege. We also particularly enjoyed the activities at Beho Beho – from the boating safari along the crocodile-infested Lake Tagalala to the incomparable experience of a walking safari that ended with us sleeping in a romantic treehouse. The white sands and turquoise waters of Zanzibar following this were like another world, though not one without its own brand of safari magic! A particular highlight was tracking the colobus monkey and discovering the mangrove swamps of Jozani Forest. We snorkelled, dived and swam in Zanzibar’s turquoise waters, encountering numerous fish and dolphin and learning about some of the challenges of preserving this unique marine life. Both lodges provided impeccable service with hospitality that made us feel right at home, one a family-like environment with communal dining, the other, a private villa with its own butler and meals anywhere we liked. From tea trays each morning to incredible guiding, mouthwatering food and stunning views, each place was unforgettably special – and we can’t wait to return. 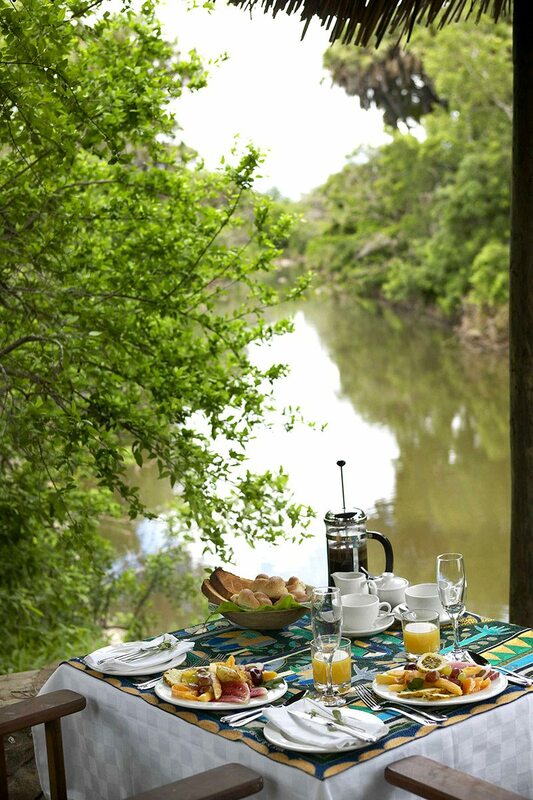 The Selous has plenty of wildlife. You’ll be met as you disembark from your international flight at Kilimanjaro International Airport in Arusha, and assisted through customs and immigration. Following a private transfer to Arusha Airport, you’ll take a scheduled light aircraft flight to Dar es Salaam, then another scheduled light aircraft flight to the Selous. 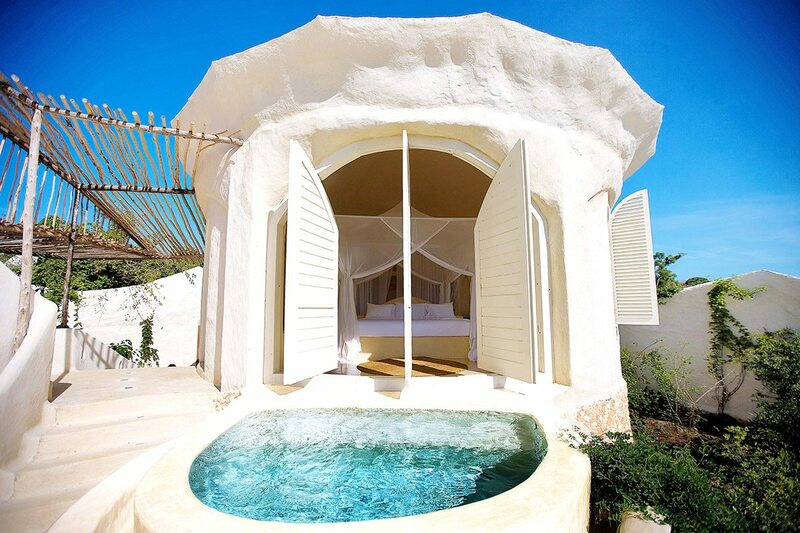 A transfer will take you to Beho Beho, where you’ll spend four nights. Following a transfer from Beho Beho to the airstrip, you’ll take a scheduled light aircraft flight to Zanzibar. 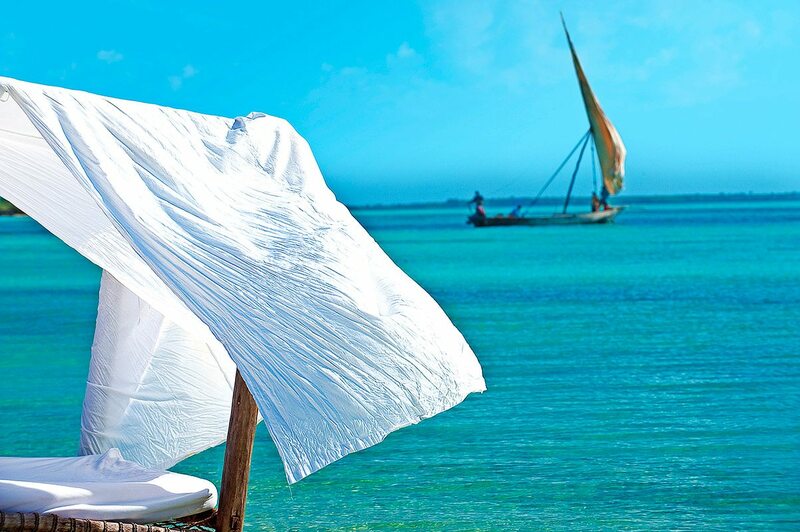 A transfer will take you to Kilindi Zanzibar, where you’ll spend four nights. Following a transfer from Kilindi Zanzibar to Zanzibar, you’ll take a scheduled light aircraft flight to Kilimanjaro International Airport in Arusha, where you’ll be assisted through check-in for your international flight. 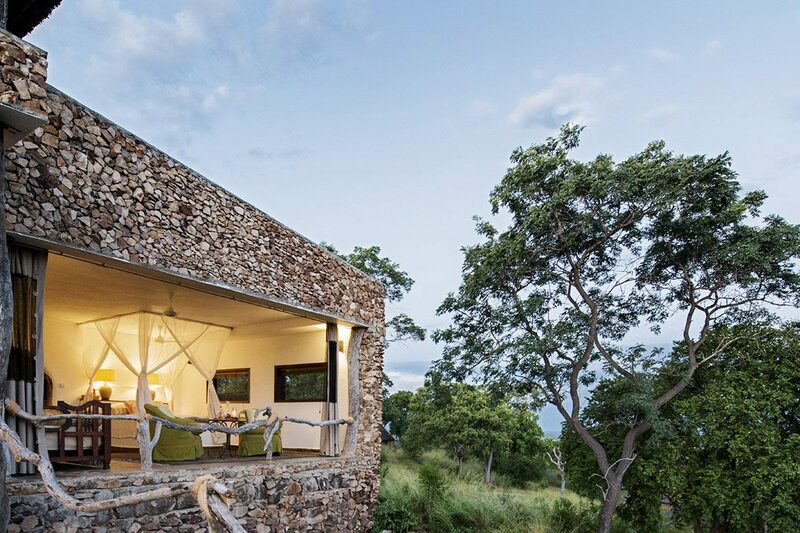 With a backdrop of plains, hills and woodlands, panoramic views of the Rufiji river floodplain, and Lake Tagalala on its doorstep, Beho Beho is ideally situated in the highlands of Tanzania’s Selous Game Reserve. 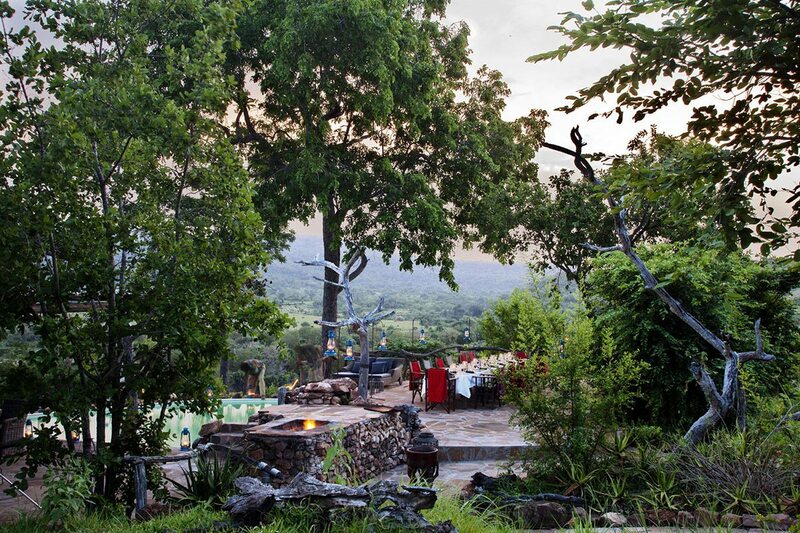 Here you’ll enjoy boating safaris, treehouse stays and daily game drives with different guides.